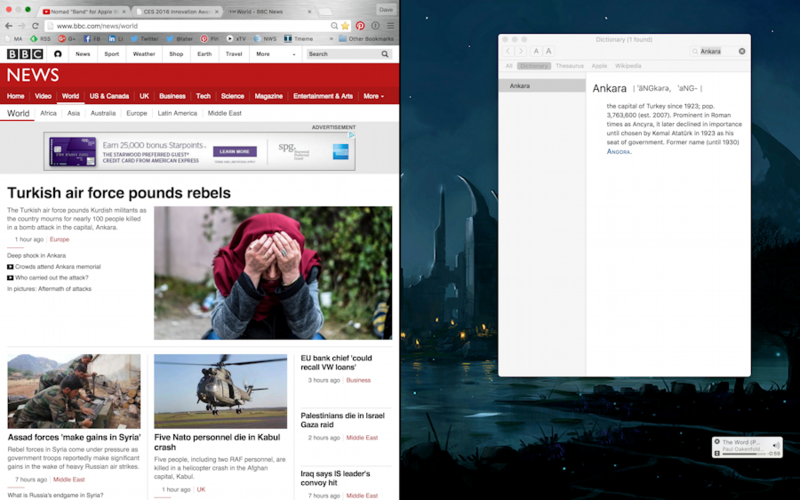 / How do I get Split View to work on Mac OS X El Capitan? 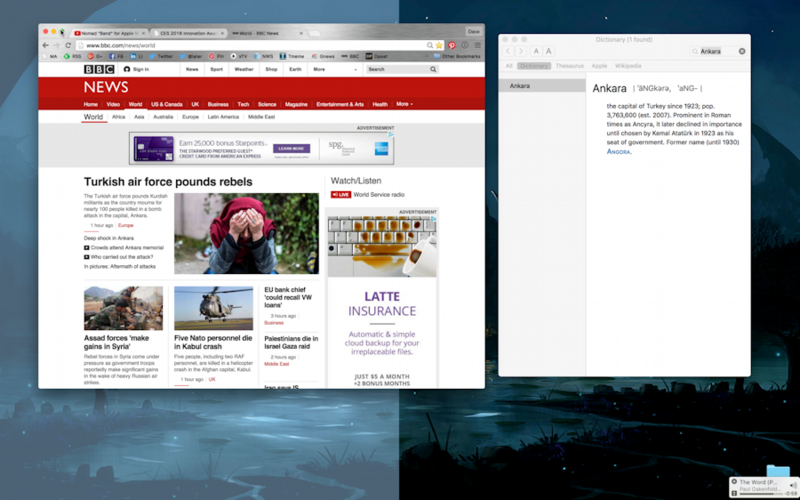 How do I get Split View to work on Mac OS X El Capitan? I’ve been hearing a lot about Split View and how it’s a nice way to work with two apps simultaneously. Okay, I’ve upgraded to Mac OS X 10.11 “El Capitan”. But I still can’t seem to get it to work! What’s the secret? 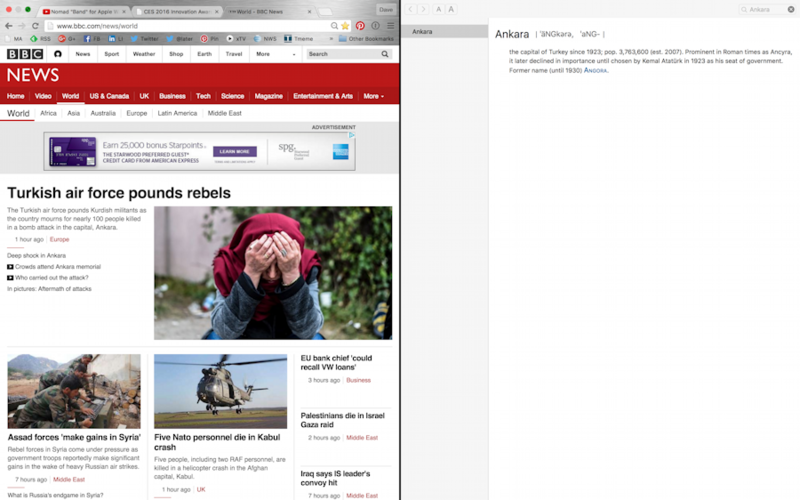 Apple’s done a nice job with the implementation of Split View, and if you have a decent size screen — like the 15″ screen on a MacBook Pro — it’s a surprisingly intuitive way to organize information on your display so that you have two active windows and nothing else distracting you while you’re working. When I’m writing a movie review for my Dave On Film site, for example, I’ll have a cast list from IMDb on one side while my blog’s edit window is open on the other side. Easy, useful. 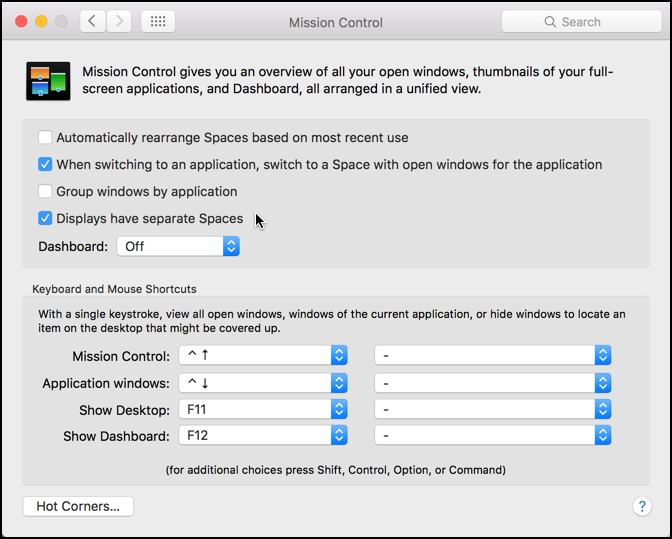 The problem is, there’s a confusingly labelled preference in your Mac OS X settings that needs to be selected for Split View to work, and it doesn’t mention a thing about Split View so it’s almost impossible to know it’s required. Hopefully in an upgrade it’ll be remedied, but for now, you’ll need to start out by going to Apple > System Preferences… and selecting Mission Control. See the fourth check box, labelled Displays have separate Spaces? That’s the one. If it’s not checked, then Split View won’t actually work for you, and it won’t have an error message explaining what’s going on, it’ll just fail to work and you’ll get to be frustrated. It would be nice to modify this to read “Enable Split View by letting Displays have separate Spaces” or similar, but that’s just me, trying to keep this the operating system “for everyone else”. Anyway, check the box, close the window, and, probably, log out and log into OS X again. 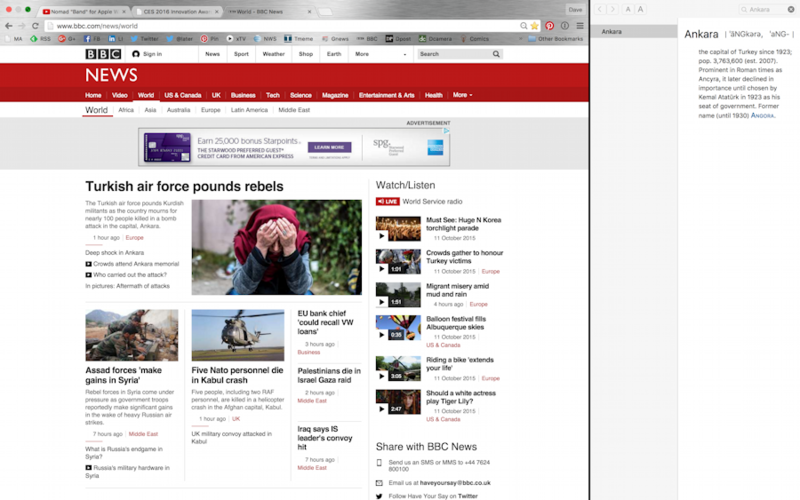 On the left you can see I’ve got Google Chrome open to the BBC News (which I check 3-4 times/day) and on the right, the overlapping window is Dictionary, where I’m looking up the name of a place mentioned in the lead article. At this point you get to decide which side of SplitView you want this window to occupy. Drag it left (with the mouse button still down) to occupy the left side, right to occupy the right side. Easy. I’ll have the browser on the left by simply letting go of the mouse (actually trackpad) button and choosing the default. 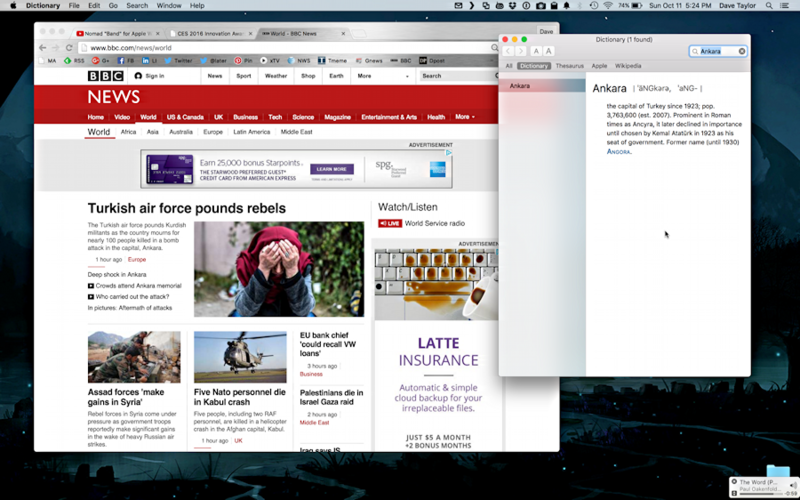 Surprisingly useful, Split View is something I’m using every day now that I’m running 10.11 El Capitan. And now you know how to work with it too! And when you’re done, just move the cursor to the very top of the screen and the red/yellow/green buttons show up again. Click the green one and the window resumes its old position on the non-Split View. Easy. How Can I Easily Generate Secure Passwords? How Do I Use LinkedIn “Find Nearby” at a Conference? 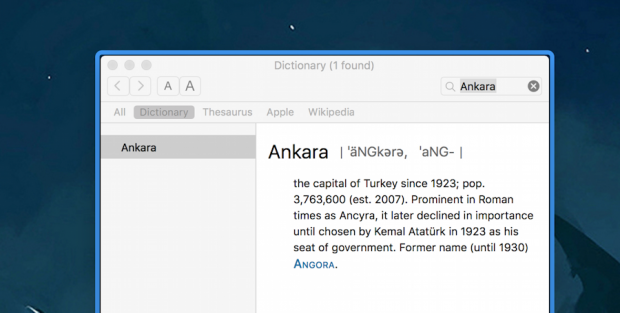 How to Enable “Open Recent” for your Mac apps?